BROOKLANDVILLE, MD. Feb. 27, 2015 – Maryland State Police report that a boozing bus driver was sidelined due to the actions of motoring members of the public who were alarmed about a whacky bus on the beltway. Charges of reckless driving and DUI against the bus driver were plea bargained away with the charges dropped in a sweet plea deal by the Baltimore County States Attorney Scott Shellenberger on Sept. 2, 2009. Police say that concerned drivers on I-695 in Baltimore County this afternoon may have helped avert a tragedy when they alerted State Police to a commercial bus operating erratically, which led to the arrest of the driver for DUI. The driver is identified as Pamela L. Willie, 52, of Randallstown, Md. Willie is charged with 23 traffic violations. They include driving under the influence, operator of a commercial vehicle in possession of alcohol, consuming alcohol in the passenger area of a vehicle, driving a commercial vehicle without an appropriate medical certificate, negligent and reckless driving, and driving off the highway. At about noon today, the Maryland State Police Golden Ring Barrack received numerous calls from motorists reporting an orange school bus on the outer loop of I-695 that was swerving and running cars off the roadway. Troopers from the barrack and the State Police Motor Unit spotted the bus approaching on the outer loop at Falls Road and observed it swerving onto the shoulder multiple times. Troopers stopped traffic on the beltway while they safely stopped the bus on the left shoulder of the outer loop. Troopers know of no vehicles that were struck while the driver was on the beltway. Troopers found Willie was the driver and only occupant on the bus. They immediately observed indications the driver was under the influence of alcohol. Further investigation led to her arrest for DUI. Troopers found four empty, full and partially full containers of beer and liquor on the bus. Further investigation indicated the driver was on her way to a private school in Montgomery County to pick up students for a field trip to Washington, D.C. It is not known where she was driving from. 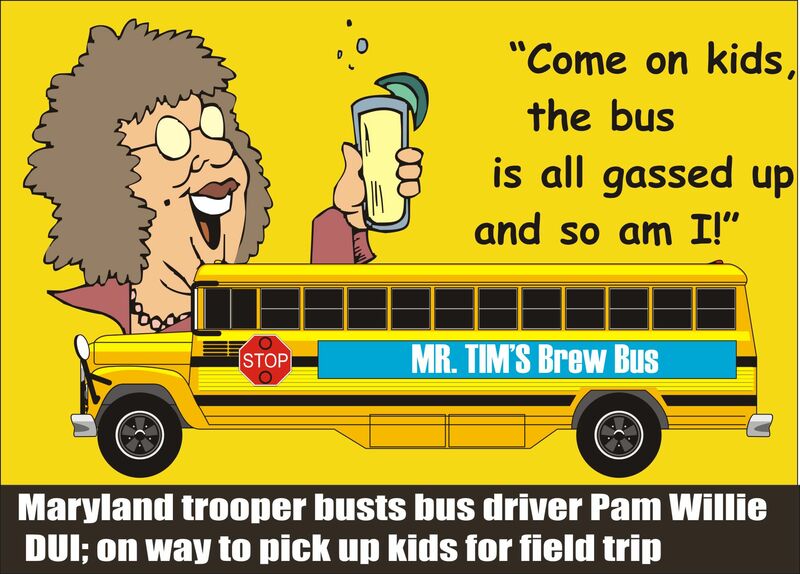 The bus was registered to Mr. Tim’s Bus Rides, of Owings Mills, Md. The owner responded to the scene and took custody of the bus. Willie was taken to the Golden Ring Barrack where she was processed and provided the traffic citations. She had a valid commercial vehicle driver’s license. She was released later to a sober driver. The Maryland State Police does not release information prior to trial concerning any DUI tests administered or the results of those tests. Trooper Joshua Begg from the Golden Ring Barrack made the arrest. He was assisted by another trooper from the barrack and two motorcycle troopers from the Motor Unit. Maryland Court records show that on Willie was charged on April 3, 2012 at 4:25 pm in Howard County with driving across the center line of a highway on Marriottsville Road when overtaking a vehicle when it was unsafe to do so. On May 31, 2012, the case was dismissed in a plea deal with no fine. In an incident that led to her arrest on July 29, 2009 by Baltimore County Officer T. McMillan, Willie was found guilty of assault and sentenced to eighteen months in jail with all of the jail time suspended. Represented by a Public Defender, paid for by taxpayers, she got a sweet deal from Baltimore County States Attorney Scott Shellenberger. Her sentence was suspended and she was required to go to drug treatment, a factor which apparently did not prevent her from being able to drive a school bus. Charges of reckless driving, driving while under the influence, possession of drugs, paraphernalia, failing to remain at the scene of an accident involving bodily injury, failure to control speed to avoid a collision, malicious destruction of property and violating an ex-parte order along with consumption of alcohol while driving were all dropped by the States Attorney in this plea deal. Her probation lasted one year. Willie’s hell-raising extends from the highway to the home as well as she was charged with domestic violence on Nov. 27, 2009 in Baltimore County District Court. She was ordered to stay away from the home. A request to rescind the order was denied by the court. This entry was posted in Bus drivers charged with impaired driving, DWI arrest photos, DWI Arrests by State, DWI news articles, impaired driving with minors in vehicle, repeat offender and tagged Baltimore County, Baltimore County States Attorney Scott Shellenberger, Charges of reckless driving, Driving Under the Influence, driving while impaired, driving while under the influence, drunk driving, DUI, DWI, failing to remain at the scene of an accident involving bodily injury, failure to control speed to avoid a collision, malicious destruction of property and violating an ex-parte, Maryland State Police, Mr. Tim’s Bus Rides, OWI, Pamela L. Willie, Pamela L. Willie charged with DUI, paraphernalia, possession of drugs, school bus driver charged with DUI, Trooper Joshua Begg. Bookmark the permalink.